and Chuck Schumer held a press conference Sunday afternoon to discuss updates, changes, and hope for the 9/11 Health Bill, which was blocked last week in the Senate. "We are on the verge of a Christmas miracle," said Gillibrand, who pointed to increased cooperation from Republican Senators for the bill, which would provide aid of up to to first responders and others who lived near Ground Zero and became sick after the attack on September 11th, 2001. It will also re-open a compensation fund for 9/11 victims. "We believe we're on the path to victory by the end of this week," said Schumer. He added that Senator Reid promised to bring the bill to the floor after the passing of the START Treaty, which aims to create a new nuclear arms treaty with Russia. The 9/11 Health Bill was shot down by Republican lawmakers this month after they refused to consider the legislation until tax cuts were extended. Gillibrand said they had worked extremely close with many Senate Republicans to reach a compromise necessary to pass the bill. The overall cost of the bill is now reduced from $7.4 billion to $6.2 billion, as a result of a settlement reached last month with may of the Ground Zero first responders. 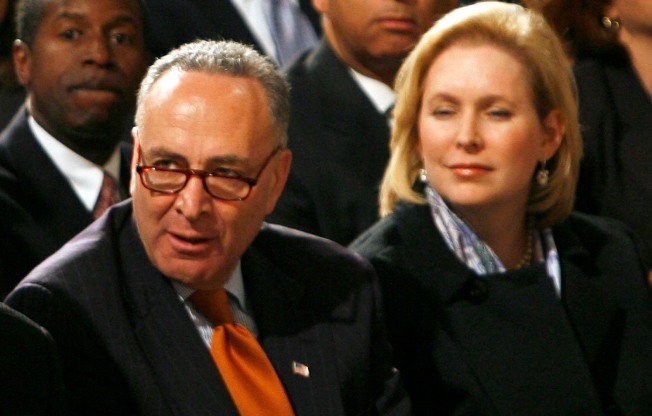 Also, Gillibrand and Schumer announced a different way to pay for the bill, one that would impose a 2-percent excise fee on certain foreign companies that receive U.S. government contracts. This raises roughly $4.5 billion over 10 years. Both Senators vowed to stay until the bill is passed, even staying for the Christmas holiday. "We will stay here as long as it takes to pass this bill through the Aenate and through the House," said Schumer. "The heroes who rushed to the towers on 9/11 deserve to be taken care of, just like our veterans. That's what America promised after 9/11, and we're holding it up." Earlier this month, the bill's supporters were three votes short of the 60 needed to proceed to debate and a final vote. The bill failed on a test vote, 57-42. Fifty-seven Democrats voted for the bill and 41 Republicans opposed it.